Although the criticisms levelled against guidelines for single conditions may sometimes be valid, we have little with which to replace them. Guidelines could be made for a few specific combinations of conditions and common comorbidities such as depression,8 but their role is limited because there are simply too many conditions and combinations to cover.2 A less well recognised limitation of guidelines is their lack of recognition of the effect of age and general frailty. The effect and management of multimorbidity in a 50 year old is very different from that in a 100 year old, in whom the burdens of both illness and treatment are likely to be greater. That said, the notion that multimorbidity inevitably results in overtreatment is too simplistic. When a new condition increases the absolute risk of a complication from an existing condition, then the argument may be for more treatment not less—for example, when a hypertensive patient develops diabetes. It is wrong to assume that the development of comorbidities should automatically lead to a de-intensification of treatment. Evidence based guidelines have contributed to improved care by providing clear standards against which care can be assessed. However, doctors increasingly feel unable to deviate from them, especially if there is an implication that this might be assessed as substandard care or lay the doctor open to criticism or sanction. Professions are in part defined by their ability to operate in the face of uncertainty,9 so we should value the ability of doctors to take a broad view of patient care and use a guideline only when they judge it to be in the patient’s best interest. This need is recognised in the pay for performance system that underpins a quarter of UK primary care physicians’ pay: a system of “exception reporting” allows doctors to exclude individual patients or indicators from the quality calculations for a range of clinical reasons.10 11 Although this system is criticised for allowing doctors to exclude the most needy patients, we believe it is essential to prevent inappropriate use of guidelines that were never intended to apply to every patient. Doctors must be encouraged to think about the patient as a whole when deciding whether to apply guidelines developed for single diseases and to consider whether comorbidities mean that a more aggressive or more conservative approach to management is indicated. Furthermore, skill at making these judgments needs to be built into medical training. Identifying goals is difficult for patients who are less articulate or need more help in guiding them through what are often complex decisions. Longer consultations are needed to deal with the “cumulative complexity”13 of patients with multiple chronic conditions. Patients value interpersonal continuity of care, especially those with chronic diseases.14 Good continuity and coordination of care are associated with improvements in patient outcomes15 16 and increased patient satisfaction.17 18 Both are important to “order the chaos” for patients with multimorbidity.19 Although the evidence linking continuity of care to improved outcomes is modest, patients in both primary care and hospitals commonly complain that they “never see the same doctor.” Perhaps even more important is that, from the doctor’s perspective, it is very hard to provide good care to previously unknown patients with multiple complex problems, especially in a time limited primary care consultation. This decline may be the result of an increasing emphasis on technical or clinical aspects of quality—for example, with routine primary care follow-up in disease specific clinics led by nurses. But there are other reasons too. Doctors are increasingly likely to work part time and to have professional interests outside clinical care such as teaching, research, or healthcare management. So they are simply less available for their patients. Of more concern perhaps, shift systems during hospital training mean that a generation of young doctors is emerging with limited experience of taking personal responsibility for a defined group of patients. The idea that problems can always be passed on to someone else at the end of a shift is difficult to reconcile with the ethos fundamental to relational continuity. General practitioners claim to value continuity of care,24 25 but in England at least, that’s not how they seem to organise their practices. In 2004, GPs were given a financial incentive to provide prompt appointments. They did so by introducing an “advanced access” system that gave prompt access, but often at the expense of patients being able to see the doctor of their choice. Most practice booking systems continue to prioritise speed of access over continuity of care despite the removal of the financial incentive. However, patients are willing to wait several more days to see a doctor they know, especially older patients and those with long term problems or conditions about which they feel uncertain.26 27 Booking systems in primary care therefore need to allow for patients who want to see their own doctor as well as those who want to be seen quickly and don’t mind who they see. Help people to understand that it’s easier for doctors to provide good care if they’re seeing patients they know. Enable online booking for both hospital and general practice clinics. This will help patients book with a doctor of their choice. Allow patients to email their doctors so that continuity can be maintained even when the doctor is off site. Protected time needs to be built into the working day for these email consultations. Much has been written of the “new professionalism,” which sees a less paternalistic relationship between doctor and patient.29 Such descriptions play down the doctor’s autonomy, emphasising the importance of evidence based practice and critical evaluation of the doctor’s performance. Although these are important, there is a danger that overliteral interpretation may disempower doctors. Clinical judgment becomes more important, not less, as evidence based guidelines become limited by the increasing complexity of patients’ illnesses. Many interventions aimed at patients with multimorbidity use new types of generalist, most often nurses (case managers, community matrons, etc).30 Such interventions are designed to increase coordination of care, but sometimes increase demand and rarely reduce cost. We seem to have forgotten the value of the skilled generalist doctor who already sits at the heart of healthcare delivery in the UK. Incentives need to be provided to improve care of patients with complex multimorbidities in primary care. However, for the reasons outlined above, these cannot be disease oriented indicators such as those currently used in the UK Quality and Outcomes Framework. Firstly, the time required by complex patients needs to be acknowledged. Payment systems for Australian doctors have for many years recognised that some patients need longer appointments, and other countries could follow suit. Secondly, the structure and organisation of primary care needs to recognise the importance for doctors and patients of building relationships over time. We have argued that multimorbidity introduces clinical uncertainty in a way that is unlikely to be resolved by ever more sophisticated guidelines. Doctors must therefore embrace clinical judgment based on their assessment of a patient’s needs. This requires time to deal with more than one problem at a time and coordination of care in ways that promote long term or at least medium term relationships between doctors and patients. This approach will inevitably emphasise the importance of generalist skills, whether among primary care doctors or those who specialise in the care of older people. We thank Stewart Mercer, Chris Salisbury, Graham Watt, Greta Evans, and Geraldine Linehan for helpful comments. Contributors and sources: Both authors have studied and reported on care for long term conditions. This paper was written following conversations arising out a research programme that includes evaluating the quality of care for people with multiple medical conditions. Both authors contributed fully to the ideas behind the paper and to writing the manuscript. Salisbury C, Johnson L, Purdy S, Valderas J, Montgomery A. Epidemiology and impact of multimorbidity in primary care. Br J Gen Pract2011;61:e12-21. Barnett K, Mercer SW, Norbury M, Watt G, Wyke S, Guthrie B. Epidemiology of multimorbidity and implications for health care, research, and medical education: a cross-sectional study. Lancet2012;380:37-43. Watt G. The inverse care law today. Lancet2002;360:252-4. Boyd C, Darer J, Boult C, Fried L, Boult L, Wu A. Clinical practice guidelines and quality of care for older people with multiple co-morbid diseases. JAMA2005;294:716-24. Hughes L, McMurdo M, Guthrie B. 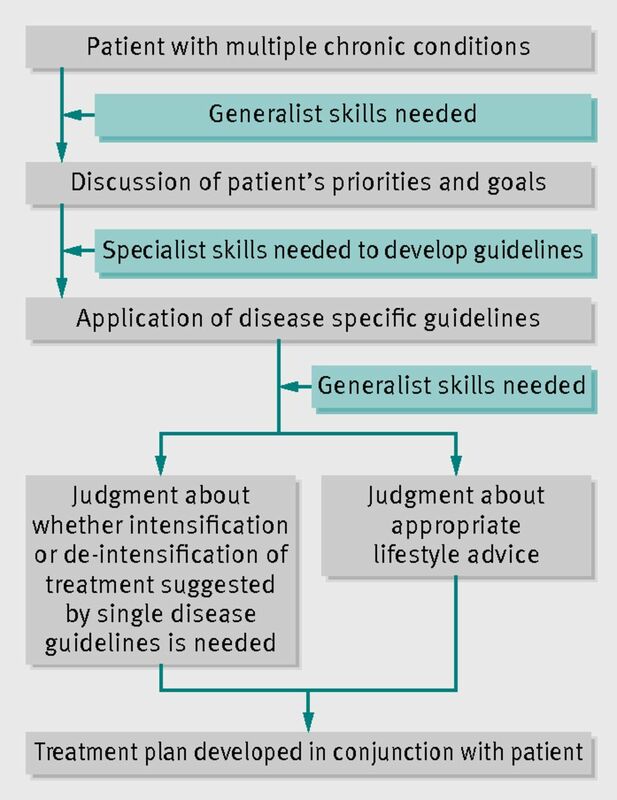 Guidelines for people not diseases: the challenges of applying UK clinical guidelines to people with multimorbidity. Age Ageing2013;42:62-9. Bayliss E, Ellis J, Steiner J. Barriers to self-management and quality of life outcomes in seniors with multimorbidies. Ann Fam Med2007;5:395-402. Mercer S, Guthrie B, Furler J, Watt G, Tudor Hart J. Multimorbidity and the inverse care law in primary care. BMJ2012;344:e4152. Guthrie B, Payne K, Alderson P, McMurdo M, Mercer S. Adapting clinical guidelines to take account of multimorbidity. BMJ2012;345:e6341. Jamous H, Pellouille B. Changes in the French hospital system. In: Jackson J, ed. Professions and professionalism. Cambridge University Press, 1970:115-52. Doran T, Kontopantelis E, Fullwood C, Lester H, Valderas JM, Campbell S. Exempting dissenting patients from pay for performance schemes: retrospective analysis of exception reporting in the UK Quality and Outcomes Framework. BMJ2012;344:e2405. Rueben D, Tinetti M. Goal oriented patient care—an alternative outcomes paradigm. N Engl J Med2012;366:777-9. Shipee N, Shah N, May C, Mair F, Montori V. Cumulative complexity: a functional, patient centered model of patient complexity can improve research and practice. J Clin Epidemiol2012;65:1041-51. Turner D, Tarrant C, Windridge K, Bryan S, Boulton M, Freeman G, et al. Do patients value continuity of care in general practice? An investigation using stated preference discrete choice experiments. J Health Serv Res Policy2007;12:132-7. Saultz JW, Lochner J. Interpersonal continuity of care and care outcomes: a critical review. Ann Fam Med2005;3:159-66. Hsiao CJ, Boult C. Effects of quality on outcomes in primary care: a review of the literature. Am J Med Qual2008;23:302-10. Hjortdahl P, Laerum E. Continuity of care in general practice: effect on patient satisfaction. BMJ1992;304:1287-90. Weyrauch KF. Does continuity of care increase HMO patients’ satisfaction with physician performance? J Am Board Fam Pract1996;9:31-6. Haggerty J. Ordering the chaos for patients with multimorbidity: building continuity of care takes work but earns trust. BMJ2012;345:e5915. Aboulghate A, Abel A, Elliott M, Parker R, Campbell J, Lyratzopoulos G, et al. Do English patients want continuity of care, and do they receive it? Br J Gen Pract2012;62:567-75. Campbell SM, Kontopantelis E, Reeves D, Valderas JM, Gaehl E, Small N, et al. Changes in patient experiences of primary care during health service reforms in England between 2003 and 2007. Ann Fam Med2010;8:499-506. Fletcher K, Sharma G, Zhang D, Kuo Y, Goodwin J. Trends in inpatient continuity for a cohort of Medicare patients 1996-2006. J Hosp Med2011;6:441-7. Sharma G, Fletcher KE, Zhang D, Kuo YF, Freeman JL, Goodwin JS. Continuity of outpatient and inpatient care by primary care physicians for hospitalized older adults. JAMA2009;301:1671-80. Ridd M, Shaw A, Salisbury C. “Two sides of the coin”—the value of personal continuity to GPs: a qualitative interview study. Fam Pract2006;23:461-8. Stokes T, Tarrant C, Mainous A, Schers H, Freeman G, Baker R. Continuity of care: is the personal doctor still important? A survey of general practitioners and family physicians in England and Wales, the United States, and The Netherlands. Ann Fam Med2005;3:353-9. Rubin G, Bate A, George A, Shackley P, Hall N. Preferences for access to the GP: a discrete choice experiment. Br J Gen Pract2006;56:743-8. Turner D, Tarrant C, Windridge K, Bryan S, Boulton M, Freeman G, et al. Do patients value continuity of care in general practice? An investigation using stated preference discrete choice experiments. J Health Services Res Policy2007;12:132-7. Hill A, Freeman G. Promoting continuity of care in general practice. Royal College of General Practitioners, 2012. www.rcgp.org.uk/pdf/RCGP_Continuity_of_Care.pdf. Royal College of Physicians. Doctors in society: medical professionalism in a changing world. 2005. http://bookshop.rcplondon.ac.uk/contents/pub75-241bae2f-4b63-4ea9-8f63-99d67c573ca9.pdf. Smith S, Soubhi H, Fortin M, Hudon C, O’Dowd T. Managing patients with multimorbidity: systematic review of interventions in primary care and community settings. BMJ2012;345:e5205.